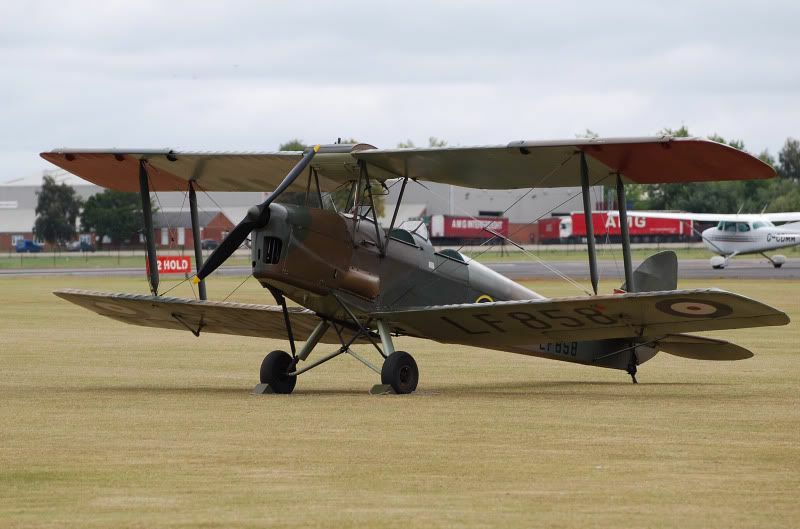 As an owner/pilot of a Tiger Moth, I am familar with the Queen Bee, how I have no idea how these were used. Were they a target, or did they tow a target drone. I am sure that many would be interested to know just what were the techniques used in operating these aeroplanes. I dont know if they were aimed at or had a target drone, but i have some info on the control systems if that would be of interest. They were, what would be called today "an expendable target drone". Radio controlled, they were launched by catapult, then radio controlled using pulse signals from (honest) an old-style telephone dial. Dialing nine or ......... gave you a dive. At the end of a flight, if the aeroplane was still intact, it either was ditched and recovered, landed on floats, or on rare occaisions, landed back, at which point when a long antenna touched the surface, the mags were cut off and up elevator selected. Three survive. One under restoration in the USA. The Salisbury Hall static exhibit (front cockpit showing test dial etc shown below) and the sole flying example which lives at RAF Henlow, owned by the 'Beekeepers' syndicate. 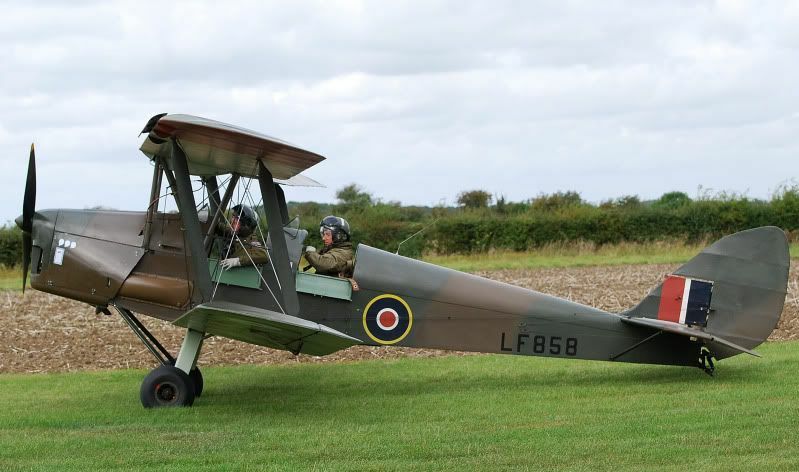 If you need to know more - I can recommend a very good Haynes Tiger Moth Manual !!! Last edited by low'n'slow; 6th January 2010, 12:21.
low n slow is quite correct although, I believe, they were also used in an 'off-shoot' sortie where naturally the aircraft was not designed to be lost. As stated the landings could be somewhat perilous as this photo of a No.1 A.A.C.U. 'V' Flight Queen Bee P-4700 shows. Note the long anatenna has wrapped around the tail. Photo taken at RAF Cleave approx 1940 although this machine survived until 1943 when lost off Manorbier 05.03.1943 whilst with the P.R.U. Couple of photos of the flying example, both from 2009, Little Gransden and North Weald .... Keith. I wonder how a Queen Bee would go as a scratch built "Tiger" from memory they are essentially a Tiger Moth with a wooden fuselage. In Australia, the most difficult bit to get for a Tiger project is the fuselage. What to others think, is there plans around for the fuselage? I know a guy that has just purchased a semi-trailer (I kid you not) of tiger spares and I think I might be able to talk him around to building one if the fuselage plans were available. Last edited by Proctor VH-AHY; 29th October 2009, 23:20. If he has any tailskid castings (the bushed part which the spring attaches to - not the actual pad) I'm in the market! Can't check at the moment, he is out of the country, I will try and find out. Is this the bit that the tail skid bolts onto. It is a bit of pipe bushed hinge on one end and as you sai the spring attaches to it. From memory this is a welded part and not a casting on Australian Tigers, not sure about pommie ones. I'll get a piccie to you - mine has worn both in the bushing and in the block - a new bush might take some of the play out for a moment but ultimately it all needs replacing. FB - doesn't the dHMC not have one in their Stockbox? If you are still stuck, PM me - I might be able to put you in touch with the required part - a picture would help me too.